The Trump administration on Friday sought to reassure allies abroad and critics at home that the U.S. withdrawal from a landmark arms control treaty with Russia is not the precursor to a new nuclear arms race, as nonproliferation advocates are warning. The administration has not decided yet what kind of missiles the U.S. may develop and field once it is freed from the constraints of the Intermediate-range Nuclear Forces, or INF, treaty. But a senior administration official briefing reporters on Friday emphasized that the United States has been "scrupulously" adhering to the 1987 agreement, and said it is only looking at conventional options at this point. "Nothing the U.S. is currently looking at is nuclear in character,” the official said. David Trachtenberg, deputy undersecretary of defense for policy, said Friday that withdrawal from the treaty strengthens, rather than damages, the framework of restrictions, treaties and other diplomatic agreements that make up international arms control. Because Russia had been flouting the INF’s terms for years and talks had produced no change in their behavior, the United States had no choice but to withdraw. “Being serious about arms control means being serious about compliance,” he said. Trump administration officials on Saturday will deliver its official diplomatic notice to Russia that it intends to withdraw from the treaty, giving Moscow six months to come into compliance — what the senior administration official called its “final chance.” Officials have painted the demise of the Cold War-era agreement as entirely Russia’s fault. 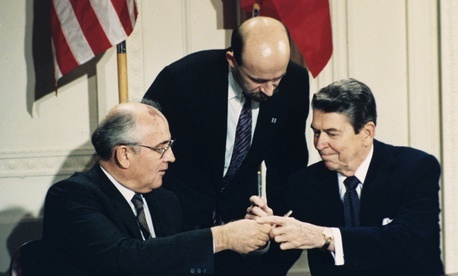 The agreement, struck by Ronald Reagan and Mikhail Gorbachev, prohibits the United States and Russia from fielding land-based cruise missiles with ranges between 310 and 3,420 miles, or 500 and 5,500 km. It has long been considered a hallmark arms control achievement that eased the threat of nuclear war on European soil. It’s not in dispute that Russia’s fielding of the Novator 9M729 cruise missile is in violation of the treaty — but nonproliferation advocates argue that both sides will now be free to build a new generation of intermediate-range missiles, tipping off a new missile race. They maintain that the United States already has sufficient deterrence capability against Russia and China without fielding the ground-based missiles banned by the treaty. China, which is not a party to the INF treaty and was not a significant military power when the agreement was struck, has fielded over 1,000 of the kinds of intermediate-range missiles that the United States and Russia were prohibited from having , according to the official. Some analysts believe that Russia’s decision to field the 9M729 was a reaction to perceived threat from nations to its east, not Europe or the United States — and it was unlikely stop whether America stayed in the treaty or not. But the U.S. is looking at options. James H. Anderson, assistant defense secretary for strategy, plans, and capabilities, at the Brookings Institution on Wednesday that the withdrawal will open the door to missiles with a range beyond 500 kilometers. In 2017, Congress mandated that the Pentagon begin to look at the possibility of extending the range of certain conventional missiles. “We have limited our efforts strictly with research and development. We will continue along existing efforts with respect to potential systems that will be conventional in nature that could be used to increase our defensive capabilities in Europe,” Anderson said. Critics argue that even if Russia wasn’t complying with the agreement, withdrawal lets Moscow get away with violating an international agreement without any penalty — and that they likely will speed their production of weapons. The administration official also denied that the decision to withdraw was an effort to combat a resurgent China, insisting that it was because of Russia’s noncompliance. “Unless we’re going to have something we all agree to we can’t be put at the disadvantage of going by a treaty, limiting what we do, when somebody else doesn’t go by that treaty, K?” Trump said on Friday. In 2014, President Obama’s State Department reported that the Russian Federation was in violation of the treaty after a flight test of the Novator 9M729. Russia conducted a second flight test in September 2015. The White House now says that Russia has deployed 100 of the missiles, or four missile battalions. “Russia has already been working as part of their nuclear modernization to modernize a lot of weapons exempt from the current arms control agreements,” said Tom Callender, a defense analyst at the conservative Heritage Foundation. Patrick Tucker contributed to this article.